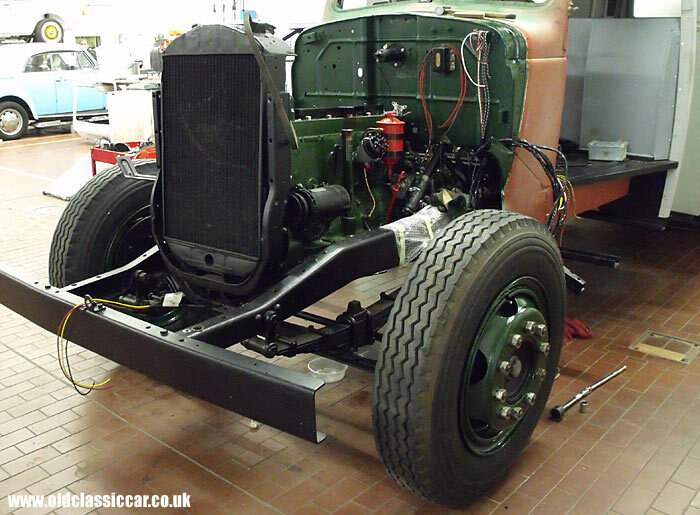 Further restoration on this classic lorry from 1940. The engine is filled with classic lubricant for the first time since it's rebuild, and new batteries purchased. Restoration Part 27. 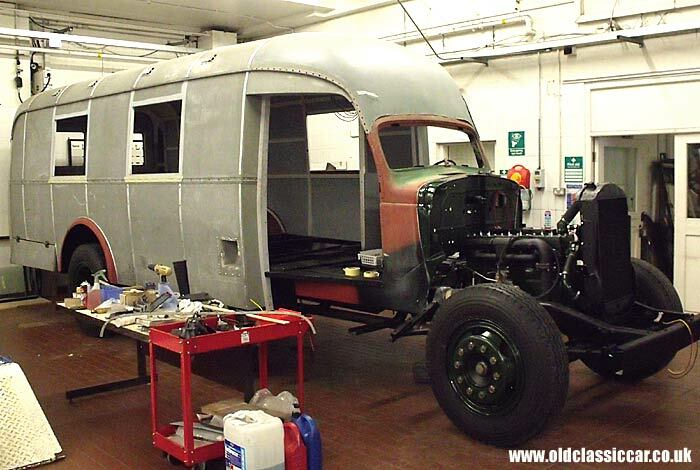 Click here to return to the main Dodge lorry restoration page. Part of oldclassiccar.co.uk. Contact page. 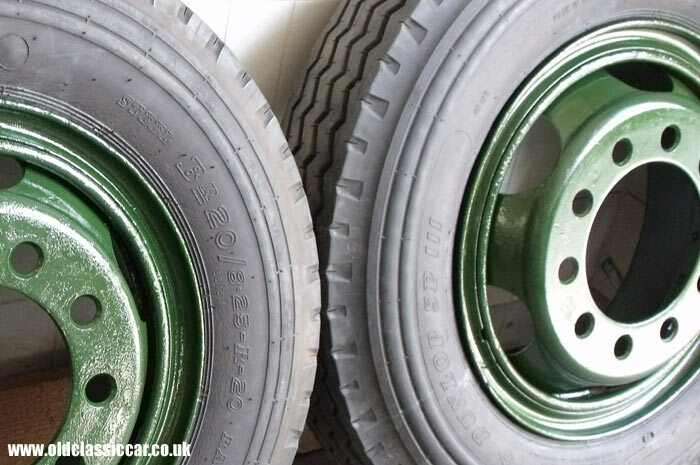 Continuing on from the work undertaken in June, more work on the front end of the lorry saw further ancillaries repaired and fitted, along with the truck being lowered from it's stands and sitting on it's repainted wheels for the first time. 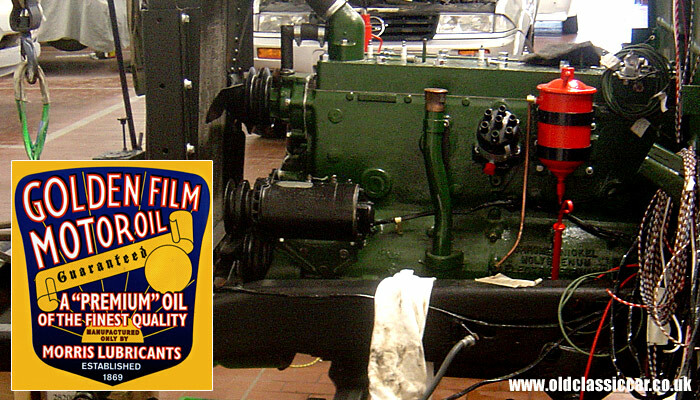 With a view to firing up the engine soon, fresh engine oil from Morris Lubricants was sourced, as were two hefty 6 volt batteries from Lincon Batteries. Thoughts also turned once again to the signwriting that will, at a later date, be re-instated on the Dodge's coachwork. 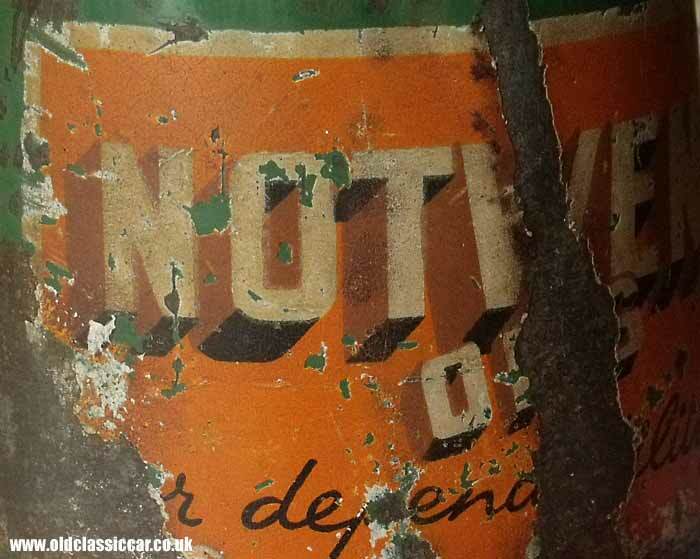 As Morris Lubricants are located not far from here, and can supply oils especially formulated for older engines, it made sense to drop them a line to see what they could supply for the Dodge. In the end we went with SAE 30 grade oil for the engine, and 140 grade for the gearbox and back axle. Further details on the oils they can supply, along with downloadable information sheets, can be found on their website. Coincidentally, I discovered that Morris Lubricants took over a firm called Newton Oils in 1997. One of the key sponsors on the side of the Dodge was Notwen Oils (see further down this page). The name Notwen switched to Newton at some point in the 1950s, so it's very appropriate that these oils should now be used in the truck. Installation of the wiring began in June, and continued into July as this photo of the cab area shows. The (silver painted) throttle linkage had been installed by this point also. A little while ago, a problem with the steering box arose which necessitated it's stripdown. With the box stripped, it became obvious that the lower bearing had collapsed and was in a very poor state. 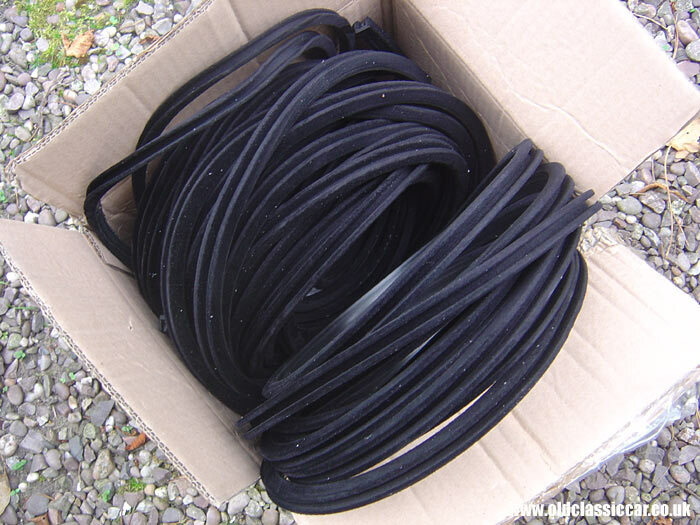 After several enquiries, VHC tracked down a company that could supply an identical bearing from stock. 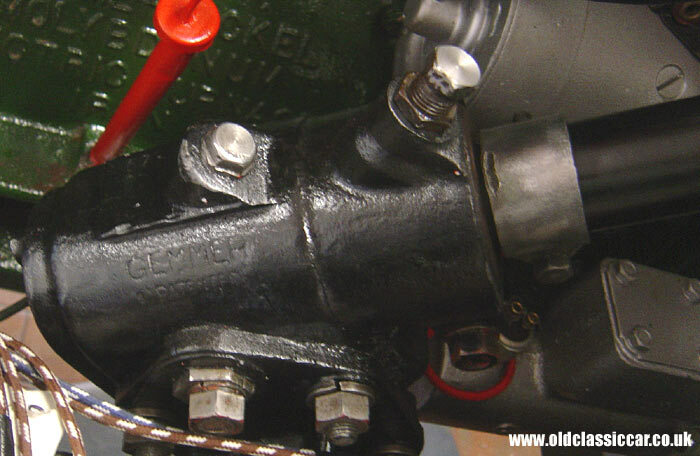 With this installed, the steering gear could be re-assembled and returned to the truck. The problem with restoring a large vehicle, is that large quantities of everything always seem to be required. The furflex trim that goes into the sliding window frames is a classic example - two different types of trim were required for each frame, one narrow type for the fixed pane of glass, and a wider re-inforced type for the sliding window. In all some 55ft of each trim were needed. Once blasted, the replacement tyres, tubes and flaps could be installed, and the rims painted. The Dunlop SP III tyres really look the part on this old lorry - some modern far-eastern tyres have tread patterns that don't look quite 'right' on an old vehicle somehow, so I was really pleased to have found these older-style Dunlops. 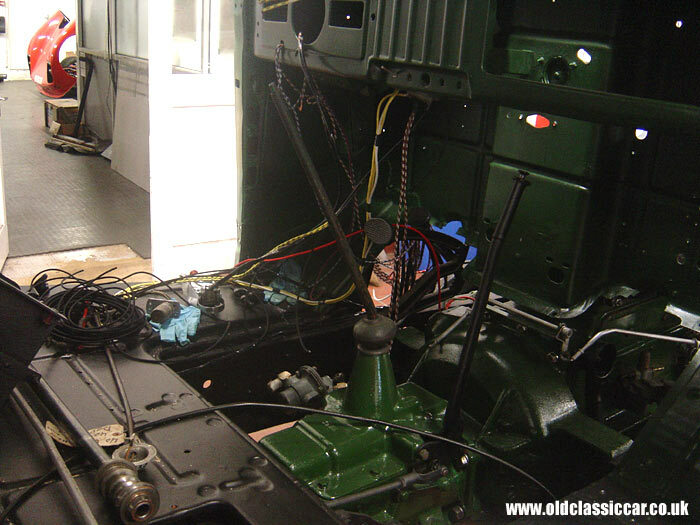 Further progress in the cab area is illustrated with the photograph above, which shows the re-furb'd speedo installed, and a period aftermarket turn signal switch attached to the column. 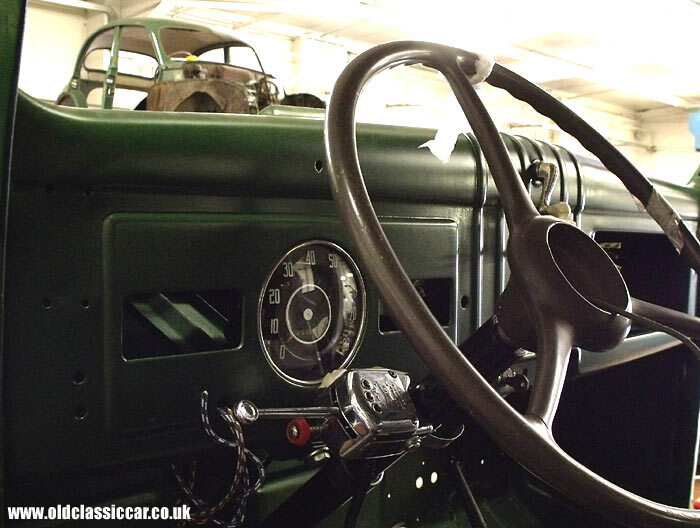 The steering wheel currently fitted is from a WW2 military Dodge (either 1/2 or 3/4 ton), however a new-old-stock 3 ton wheel will be fitted before the truck returns to the road. The larger diameter 3 ton wheel turned up in Australia some years back, and was airmailed over to the UK, still in it's original packing. Also now back in the cab, the winding mechanism for the front screen. This had been damaged, so a repair was effected and the mechanism returned to the cab. Virtually every part in the Dodge has had to be cleaned, re-furbished and usually re-painted. 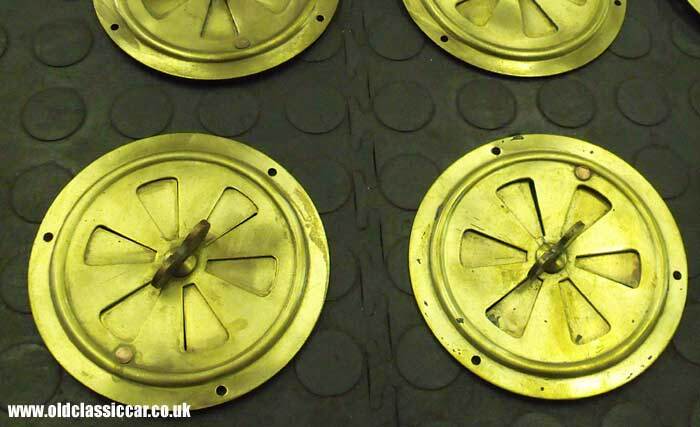 Shown here are the rotary air vents that are fitted high up inside the rear body. Originally these would have been used by the aircrew members, as they were ferried to and from their aircraft on an RAF base during the war. Built in brass, with copper rivets, it's a shame to paint them really. Now that the tyres had finally been re-united with the wheels, they could be installed on the truck and the old girl dropped down off the axle stands. 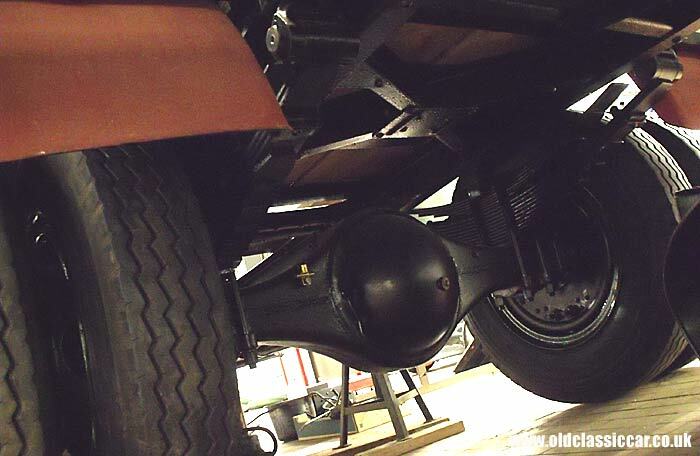 This shot shows the underside of the truck, taken while the rear wheels were being re-fitted. During the war, the diff cover was painted white, in order that following vehicles could distinguish the Dodge during hours of darkness and the black-out. This will be re-instated as a nod to it's military past. Back on it's wheels for the first time in a little while, the original (re-plated) wheelnuts all in place and tightened up. The rear bulkhead panel, fitted behind the driver's seat, is also seen temporarily re-installed. Another look at the truck back on it's wheels. The apertures for the rear window frames had been primed by this time too, in readiness for the imminent installation of the frames. As already mentioned, the plan is to fire the engine up quite soon, for the first time since all the repairs of 2007/8. Obviously new batteries would be required, so a call was made to Lincon Batteries, to see what they could come up with. They are able to supply proper rubber-cased batteries in the old style, perfect for a restoration like this. As the Dodge is sticking with 6 volt electrics, we opted for 2x 144amp 6v batteries, which were supplied dry, with the acid in separate containers. Thanks to William at Lincon who quickly dispatched the batteries to me. 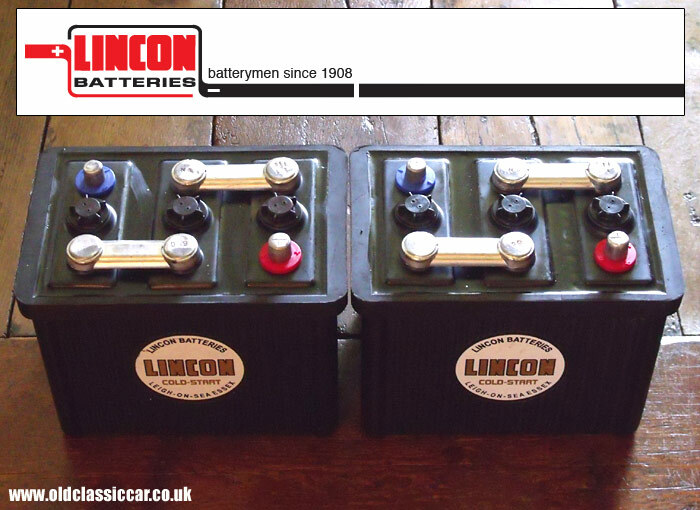 The full list of their 'classic' batteries can be seen here on the Lincon site. Discussions between myself, VHC, HMG (Paints) and Craftmaster Paints, have focused on the correct shades of colour to use when the signwriting is applied. The main colours to establish are yellow and orange, the latter being prominent on the vehicle advertising Notwen Oils. The yellow will be used on the advertisements for Dunlop Tyres, Ferodo Brakes, Lodge Plugs, and SU Carburettors and Fuel Pumps. Shown above is an old oil pourer that features the same advertisement as will be re-created on the Dodge. The plan is to clean this up, and, along with old signwritten panels from the truck, find a close match in current paint charts. Return to the Dodge lorry restoration page for more info on this rebuild. Previous Page: Part 26 - Engine ancillaries and dashboard refurbishment. Next Page: Part 28 - Wood is sourced and fitted in the back.